I love to watch the morning light chase away the darkest shadows. The sun always burns away the frost, takes the chill from the air, sets diamonds in the fresh snow, dispels the darkness. There is always hope in the light. The darkness causes chaos and panic, the light brings peace and calm. Like the power outage on Black Friday. Somewhere a transformer blew and we were left in utter darkness. Literally, for a brief moment, you could not see your hand in front of your face and the house was still and silent. Then panic rose and the children cried out. I told them to stay put and not to move anywhere until we got some light. My daughter grabbed her iPod and clicked it on and there was the tiniest wink of light and then we went in search of more flashlights and candles. There was a hyperactivity as the adrenaline kicked in, but once we had the house aglow there was a tranquil stillness and a soporific calmness despite the fear lurking in the shadows of the darkness. It led to a relaxing candle-lit bath and early retiring to bed. And just as we were blowing out the candles to bunker in for the night, the power was restored and the lights all blinked back on and the darkness vanished. The light always makes the darkness vanish. "At night Christ was born, a light in darkness; noonday turned to night when Christ suffered and died on the Cross. But in the dawn of Easter morning Christ rose in victory from the grave. And brings us joy and life and light. In the morning light, with coffee in hand, I crack open to day 3 in The Greatest Gift and chew on the words from near the beginning of the story of how Adam and Eve hid. Their sin had exposed them and they were ashamed. God had told them that if they eat of the fruit of the tree in the midst of the garden, the tree of the knowledge of good and evil, they would surely die. And in their hiding we see how they did. Away from God's presence they were lurking in the shadows, dead in the darkness of sin. 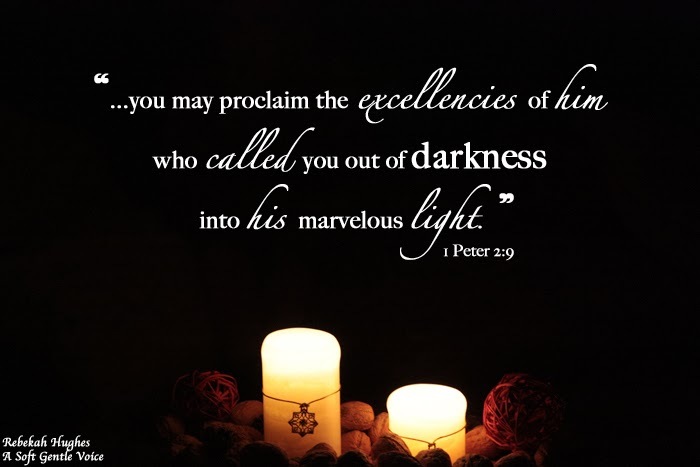 The only way to come to the Unapproachable Light was to respond to God calling them. We would never seek God unless He called out to us first. "He lives in light so brilliant that no human can approach him." The ones who had been created to walk in the garden with Him, now hid ashamed and had no way to undo what had been done, no way back to Him. It is our tendency - to hide, to cower in shame and the only way we can come to the Light is to heed His call. And the Fathers of lights whom no human eye has seen graciously calls us to Him that we might be admitted into His presence once again. He called Adam and Eve out of the shadows, covered their shame, and protected them from living in this permanent state away from God's presence with the glimmer of hope of the Light to come. and his life brought light to everyone." We have walked in darkness, but the Light came, and with Light, there is hope. Linking with Tuesdays Unwrapped at Chatting at the Sky as this was what I unwrapped this Tuesday. What did you unwrap today? Would love to hear about your Tuesday Unwrapped.